Beth Collier (M.A., MBACP), is a qualified Integrative Psychotherapist practising Nature-based Psychotherapy and supervision, seeing all her clients outdoors using London’s parks and woodlands as therapeutic spaces. She started to work with clients within nature in 2012 and since 2014 only offers nature-based sessions. Beth has a B.A. in Comparative Religion and Social Anthropology, an M.A. in Psychotherapy and Counselling and an M.A. in Human Rights. Beth is a naturalist and bushcraft practitioner with an interest in traditional ecological knowledge and ethnopsychology. She enjoys natural navigation, tracking and basketry and has experience of wilderness living in Scotland and Sweden. Beth has a certificate in Advanced Wilderness First Aid. She has a life long passion for nature stemming from a rural upbringing. Beth is the Founder of Wild in the City, an organisation supporting the wellbing of urban residents through connection with nature, offering experiences in bushcraft, natural history and ecotherapy; using the skills of our ancestors to nurture a deeper connection with the natural world. 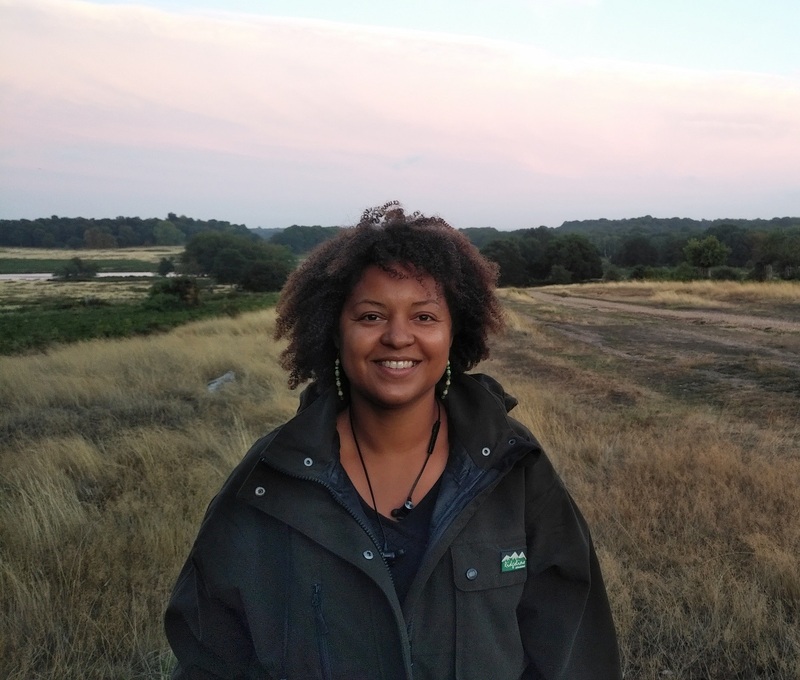 Beth has a particular interest in supporting people of colour in finding their place in UK natural settings and creates opportunities for the representation of black leadership in nature. Her work has produced ethnographies of our intimate, emotional relationships with nature. This includes ethnography of disconnection and it’s impact on the development of cultural attitudes which shun nature; experiences of people of colour in nature in UK settings and white attitudes to black presence in nature. Beth established the Nature Therapy School to provide high quality training to psychotherapists and outdoor professionals interested in collaborating with nature in their work supporting emotional health. She has run trainings in Nature-based Psychotherapy since 2014. Beth has theorised the practice of Nature-based Psychotherapy as an orientation of practice and as a frame for actualising established modalities in natural settings and is writing a book presenting these ideas, to be published by Routledge in 2019/2020. Beth is a Trustee of the National Park City Foundation, a role in which she leads work on nature, health and cities; a Fellow of the London Environmental Educators Forum and a visiting lecturer at the Wellbeing Faculty of the Institute for Arts in Therapy and Education. Beth worked in the human rights field for 16 years, the last 8 of which she ran a research consultancy working in partnership with UNHCR. Between 2008 – 2010 she was Research and Policy Manager at the Mental Health Providers Forum, leading four panels of experts in a review of methodologies used by NICE in the evaluation of the effectiveness of psychological therapies from scientific, philosophical and service user perspectives. She is co-author of Recovery and resilience: African, African Caribbean and South Asian women’s narratives of recovering from mental distress, London, 2011, Mental Health Foundation and Survivor Research and is author of Country of Origin Information and Women; Researching Gender and Persecution within the Context of Asylum and Human Rights Claims, London, 2007, Asylum Aid.